Large Popcorn, No Butter: Warm Bodies: HorRomCom? 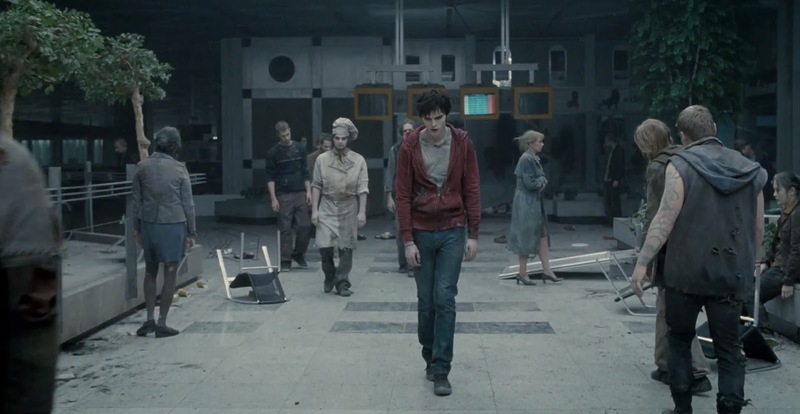 Got a sneak peak of the latest genre hybrid out there: Warm Bodies. I was actually pretty interested to see how this HorRomCom (horror/romantic comedy, copyright Nick Grajewski) sized up to some of the other ones of its kind. 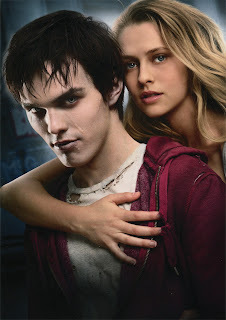 For those of you who haven't seen the preview, this movie is about a guy named R (Nicholas Hoult), a guy in his early 20s (presumably) who is having trouble connecting with people. No wonder, seeing as how R is a zombie. But he's special. R seems to have a mental capacity that excedes those around him. Instead of roaming around without any thoughts of his own, we (the audience) get to hear his inner monologue and thus discover the depths of his personality. His whole life (life?) 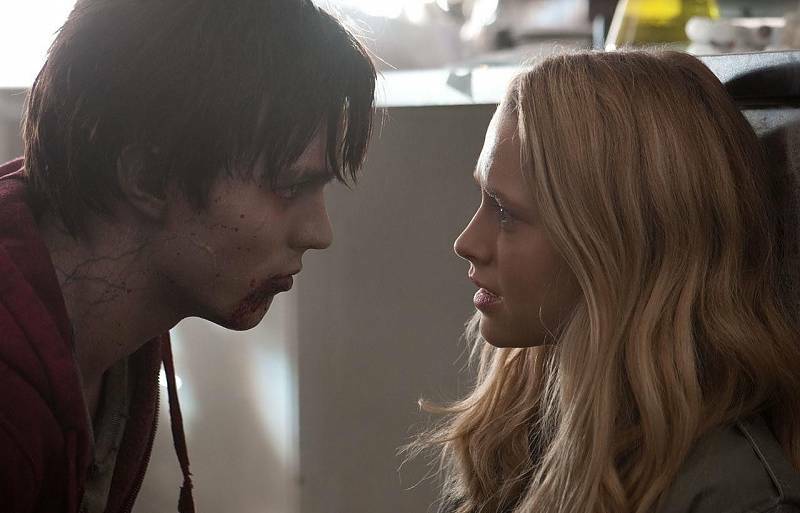 changes, though, when he bumps into his true love while he is eating her boyfriend's brains (awkward). Taking her back to his home at the airport, R bonds with Julie (Teresa Palmer). She begins to see (and he begins to experience) that the zombies are capable of changing back into humans once they remember how to love. R and Julie's now-romance becomes a race against time as they strive to unite humans and zombies against the "bonies" who have sworn a vendetta against them all. No thank you. Please get off. Hmmm, so at first glance, it's not bad. I'm gonna talk about the things that I like about this movie. First of all, I loved the soundtrack. It very gracefully unites classic pop and old rock with the latest electro-pop, grouping together the nostalgia that R has for the past and the promises for the future. I also really liked that they add humor into the plot, despite the intense themes. R's friend Marcus (Rob Corddry) carries about half of the humor of the whole movie and he's hilarious. Also, the plot has you rooting for R and Julie to get through everything that they have to get through and really tries to portray that whole "love against all odds" thing. The main issue that I had with this film is the chemistry between R and Julie. I totally get him falling head over heels for her (she's beautiful and seems pretty cool), but I didn't so much get that vibe from her. She is constantly running away from him, which probably is trying to elude to her vivacity but really just makes you kind of think she's a little put off by him. Also he comes across as this soulful kind of dreamer and, while she never seems like a ditz, I just couldn't really see them together. She exudes this sort of popular girl vibe and he seems more like the class poet (when will Hollywood stop putting these two types of people together?). That kind of stood in the way of me being 100% in favor of their supposed "written in the stars" romance. I think part of the movie's problem is that it tries to do too much and satisfy too many people. Had this not been a Hollywood production I think it would've done much better. I could've seen Julie as a more artsy lost type and then she and R would've had a little bit more in common. As opposed to Julie the poor little rich girl who has been tolerating this zombie who took her hostage and then doesn't see anyone else around so she falls in love with him. With a more artsy character for Julie, the movie would've read more like Wristcutters: A Love Story and other bleak films that carry a central theme of love as hope. As is, though, I just didn't fall for it. As an aside, Nick and a few other of the theater patrons also seemed to be annoyed at the low-budget CGI "bonies". I didn't really mind it that much since I think if they were overly scary it woud've put the movie more in the horror category, but if you're a sucker for graphics, that might getcha down. Django Unchained: Yes, Please, More, Thanks.